Your cars tyres are the only contact patch between you and the road, so it makes sense to keep them in the best condition that you can. Tyres must always be correctly inflated, under or over your cars recommended pressure can shorten the life of your tyres and cause uneven tyre wear. Tread depth must be over the legal limit of 1.6mm through out a continuous strip in the centre 75% of your entire tyre circumference. Failing to meet these legal requirements can result in a hefty fine and points on your licence as well as being dangerous on the road. At Crocker street Tyres & Mot we offer the best brands for our tyre fitting service, we have tyres to suit all makes and models as well as different budgets. 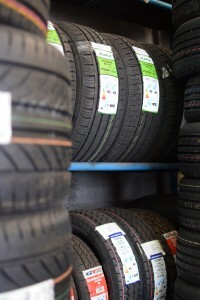 All tyres are full balanced, sealed and correctly pressured for your vehicle. We strongly recommend that you have your cars Wheel Alignment checked when fitting new tyres or replacing tyres with uneven wear, this will prevent the same damage appearing on fresh tyres.